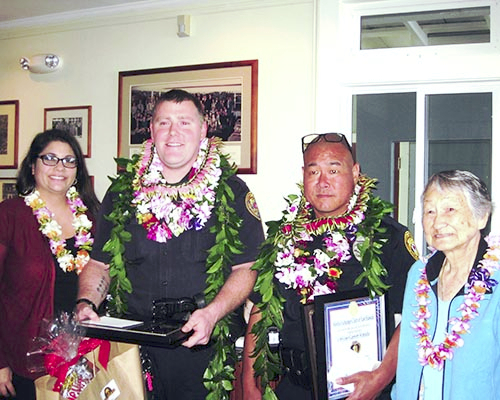 Officer Joshua Gouveia, second from left, with his wife, Emmalyn Gouveia, and Officer Garret Hatada with his grandmother, Yasuko Hatada, pose after being recognized by the Aloha Exchange Club of East Hawai'i. The Aloha Exchange Club of East Hawaiʻi held a “Wounded Officers Recognition Luncheon,” Thursday (January 23) to honor South Hilo Patrol Officers Joshua Gouveia and Garrett Hatada, who were shot and injured last year in the line of duty. 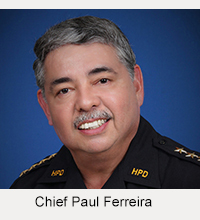 On January 2, 2013, police responded to a report of several gunshots heard in the area of Kīlauea Avenue near the Wailoa River in Hilo. While checking parked vehicles in the area of the 800 block of Kīlauea Avenue, officers observed a man hiding under a parked vehicle. 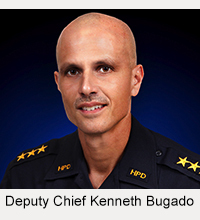 When Officers Gouveia and Hatada approached him, they were fired upon and sustained gunshot injuries. One of the officers was able to return fire. The suspect, 31-year-old Keaka D. Martin of Hilo, fled the area on foot but was captured the next day. He was charged with two counts of first-degree attempted murder, second-degree reckless endangering and six firearm offenses. The “Wounded Officers Recognition Luncheon” was held in place of the Aloha Exchange Club’s monthly “Officer of the Month” event.